Woohoo, it's a New Year!! Have you chosen your word for 2014? The one little word as your intentions/guide/theme/mantra for the year? We would love to know what it is and for you to leave a link to your Word Hop 2014 blog post and leave a comment with the word you have chosen in it. When you have time during the month you can hop around to other people's blogs and read about their word and leave a comment so they know you popped by. Please write your name in the first section so we know whose blog we are hopping to. If you are joining the Word Hop, please copy the address for the blog post you want us to read. Be aware that a year from now, someone might happen upon this and want to read your post. If you have only included your blog address, they will not be able to find this specific post buried in all the other awesome posts you write. So make sure you copy the actual post address. Then, please also make sure your post has a link to this post so when folks read what you wrote, they can easily find the party. The linky will be open for one month. We would also like to invite you to join our site so that you can keep informed about other blog parties we will be hosting - we would love for you to come back again and again. Thanks everyone, I'm looking forward to hopping by and reading your blogs. 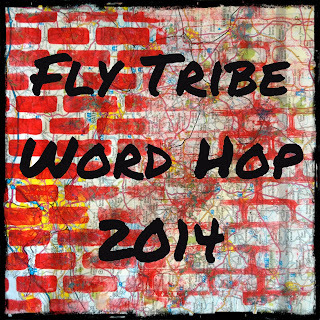 The Fly Tribe invites you to join us for our Word Hop 2014. Towards the end of the year we choose a word that will be our guide or theme for the following year. In early January 2014 write your Word Hop 2014 blog post about the One Little Word you have chosen to describe your intentions/guide/theme/mantra for 2014. On Wednesday, January 1st, 2014 I will publish another blogpost where you can link your Word Hop 2014 blog post and leave a comment with the word you have chosen in it. When you have time during the month you can hop around to other people's blogs and read about their word and leave a comment so they know you popped by. Can you identify a single word that sums up what you want for yourself in 2012? It can be something tangible or intangible. It could be a thought, or a feeling, or an emotion. It can be singular or plural. The key is to find something that has personal meaning for you. This is not your mother's word or your spouse's word or your child's word - this is YOUR word. One little word can have big meaning in your life if you allow yourself to be open to the possibilities. And here's one thing that is totally interesting: sometimes a word will pop into your brain and it will not make any sense to you right now. Give it some time. Let it percolate a bit. I have often found that our hearts speak to us in very unique ways. Maybe this is a word you need to hear but just aren't ready for it yet. Thanks everyone for joining in, if you have any questions then leave them in the comments below and I'll answer them. I look forward to reading your Word Hop 2013 posts. Here is some more information on choosing a word to guide you through the year with thanks to Christine Kane, Dec 2007. Woohoo, it's a New Year!! Have you chosen your word for 2013? The one little word as your intentions/guide/theme/mentor for the year? We would love to know what it is and for you to leave a link to your Word Hop 2013 blog post and leave a comment with the word you have chosen in it. When you have time during the month you can hop around to other people's blogs and read about their word and leave a comment so they know you popped by. If you would like to put it on Instagram then use the #flytribewordhop2013 so we can check it out. If you are joining the Word Hop, please copy the address for the blog post you want us to read. Be aware that a year from now, someone might happen upon this and want to read your post. If you have only included your blog address, they will not be able to find this specific post buried in all the other awesome posts you write. So make sure you copy the actual post address. Then, please also make sure your post has a link to this post so when folks read what you wrote, they can easily find the party. The linky will be open for one week. We would also like to invite you to join our site so that you can keep informed about other blog parties we will be hosting - we would love for you to come back again and again. 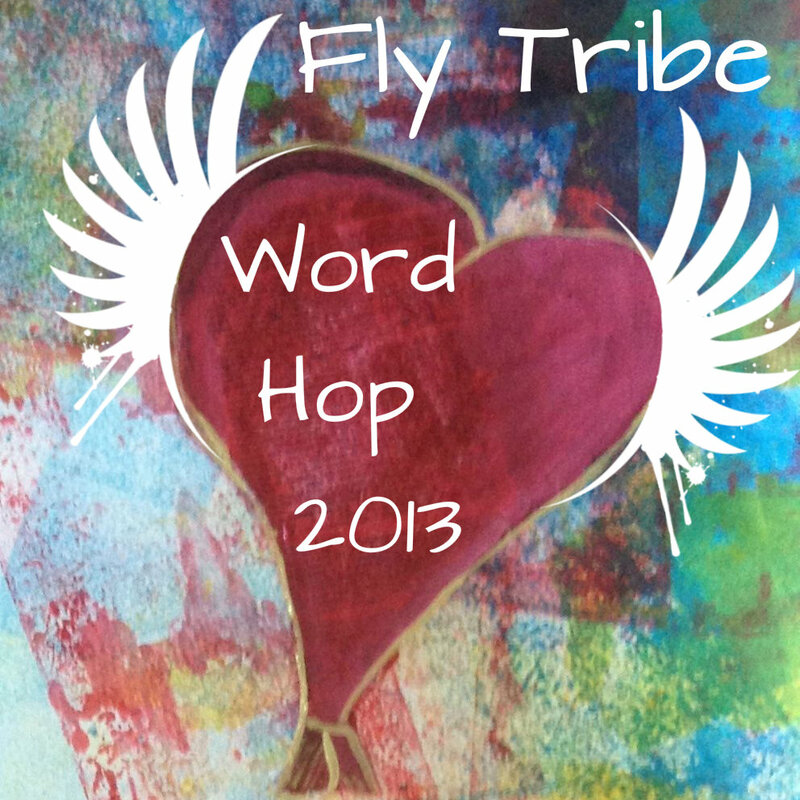 The Fly Tribe invites you to join us for our Word Hop 2013. Towards the end of the year we choose a word that will be our guide or theme for the following year. In early January 2013 write your Word Hop 2013 blog post about the One Little Word you have chosen to describe your intentions/guide/theme/mentor for 2013. On Monday, January 7th 2013 I will publish another blogpost where you can link your Word Hop 2013 blog post and leave a comment with the word you have chosen in it. When you have time during the month you can hop around to other people's blogs and read about their word and leave a comment so they know you popped by. If you would like to read what other people chose for their word in 2012 then check out the Fly Tribe Word Hop page for links. Again, be open to the possibilities. We would also like the thank Ali Edwards for inspiring us and creating a space for us to grow as individuals and to come together as a Tribe. Thanks, Ali! ETA: 7th Jan 2013 Please go to the next blog post, Word Hop 2013, to add your link to the list. Thanks. We have been blown away by the amazing turn out for the Flying Lessons Give-Away. You have most generously shared your hopes and dreams with us. What a dear gathering of Creative Spirits! We have randomly chosen sixteen names from the nearly 700 entries we received between the comments and emails. In some cases, you will see that we were only given a first name along with an email. Each chosen participant has been emailed to inform them of their spot in Flying Lessons. We hope if you were not chosen that you will not let that stand in your way of moving towards your dream. We believe in you and wish you the very best in your journey. Spread your wings and fly. TeedeJee (Tineke), Mindful Metta Moment, Dawn Anderson, Rose Buchmiller, Suzi Poland, Kerry Estey Keith, Katherine Mitchell, Natalie B., Jenny Baio, Kelli Watcherson, Rachel Carroll, Anna Dakin, Helena, Chrissy, Laurie, Quilt Maker Cottage. The Flying Lessons Give-Away was sponsored by the following Flyers in celebration of our first year of sisterhood. The Fly Tribe came together as a bunch of individuals looking to learn a bit about what it meant to run a creative business. We came together to take Kelly Rae Robert's Flying Lessons. Along the way, we made some friends, we supported one another's dreams, we lifted one another up when difficulties (in business and life) threatened to get the better of us. We didn't just learn to "Take Flight" (as Kelly Rae's course suggests). We learned to Give Flight to one another. Now with one year of soaring under our wings, we want to share the love. 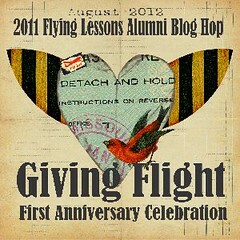 Giving Flight Blog Hop and Flying Lessons Give-Away. 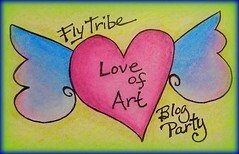 Giving Flight Blog Hop: The Fly Tribe is an amazing community built around supporting one another. Follow along on our blog hop by clicking through to the addresses listed below and discover some of our thoughts on The Spirit of Giving. Flying Lessons Give-Away: We have had such an amazing year after taking Flying Lessons, that we want to offer others the same incredible experience we have had. The Flyers have banded together to fund a whopping 8 Flying Lessons spots that we are giving away. Can you feel the love?! But the giving only starts there. Kelly Rae Roberts has joined us by MATCHING our gift with additional 8 classes for a total of 16 Flying Lessons spots. Doesn't she ROCK?! You can find details for the give-away below. We have been thinking of YOU. We have been thinking about the dreams you have, the places where you are feeling stuck and wish you just had some direction. We remember wishing we had a someone we could work through the big creative business questions with. Last year, we signed up for Flying Lessons with Kelly Rae Roberts. The class gave us direction. It put a frame around some of the chaos we felt in trying to do it all on our own. It gave us courage, and it gave us others creatives to connect with. It gave us wings. When our first anniversary came around at the same time as Kelly Rae's very last Flying Lessons class, we wanted you to know exactly how we felt. We wanted you to have a chance to (as Kelly Rae says) "help your creative biz soar." We have had such an amazing year after taking Flying Lessons, that we want to offer others the same incredible experience we have had. The Flyers have banded together to fund a whopping 8 Flying Lessons spots that we are giving away. Can you feel the love?! But the giving only starts there. Kelly Rae Roberts has joined us by MATCHING our gift with additional 8 classes for a total of 16 Flying Lessons spots. We want to share those with YOU. We are so happy you want to be considered for one of the 16 class spots Kelly Rae Roberts Flying Lessons. Here are the guidelines. To participate in the Flying Lessons Give-Away, please leave a comment below. To be fully considered, make sure to leave an email that will allow us to contact you in the event that you win. Winners will be chosen by random number generator. Entries close at 11:59 pm Central Time on August 27, 2012. Winners will be contacted by email and announced here on August 29, 2012. The Fly Tribe is celebrating a year since we came together for Kelly Rae Roberts' Flying Lessons. Along the way we have taken what we learned during the class and put it into use in a variety of ways. Some started blogs, others got published in magazines, some opened stores for their creative wares, and some kept doing what they were already doing, but a bit better. Whatever we did though, we found that we weren't doing it alone. We really did find a tribe in the class. We found a community filled with new friends. We supported one another as we walked through the fear of reaching for success. We even supported one another when life got us down. Especially when it got us down...or sent challenges that felt bigger than us. We found a sisterhood. As the first anniversary of the 2011 Flying Lessons class comes around, our private Facebook group is abuzz with remember-when's, with gratitude, and thoughts of what the coming years will bring. One thing we know for sure is that we want to make our anniversary about celebrating the spirit of giving that has been such an important part of our journey this year. So for the month of August, we are focusing on giving. Check back on the 20th to find out just how we are doing that...as individuals and as a group. I think you just might find our giving could give you flight! In the Summer of 2011, nearly 400 individuals came together to cultivate their dreams to be creative entrepreneurs in Kelly Rae Roberts e-course, Flying Lessons. The class offered a closed group that allowed the individuals to ask questions and share their knowledge with one another. Before long, the group grew to support one another's personal and professional becoming. This space is a way for us to share our enthusiasm for creativity with you and to give you opportunities to reach for your dreams and fly. The images on this blog are the property of the individual artists who created them.. Ethereal theme. Powered by Blogger.